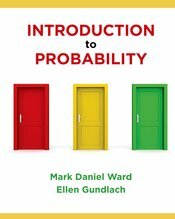 Unlike most probability textbooks, which are only truly accessible to mathematically-oriented students, Ward and Gundlach’s Introduction to Probability reaches out to a much wider introductory-level audience. Its conversational style, highly visual approach, practical examples, and step-by-step problem solving procedures help all kinds of students understand the basics of probability theory and its broad applications. The book was extensively class-tested through its preliminary edition, to make it even more effective at building confidence in students who have viable problem-solving potential but are not fully comfortable in the culture of mathematics.